There are a variety of rooms available at the Hotel de Crillon. There are single or double rooms, plus a wide variety of suites, ranging from Junior Suites, to Presidential Suites to the Bernstein Suite which is world famous. All rooms offer 18th century decor and have their own colour scheme. Hotel de Crillon is located in the heart of Paris. All major airlines offer flights into Paris daily. Hotel de Crillon is a luxury hotel located in Paris – saturated in rich history and culture, you will never forget your stay at Hotel de Crillon. The hotel overlooks the magnificent Place de la Concorde and is located next to the elegant Rue du Fauborg St Honore offering an exceptional location to all of its guests. Hotel de Crillon offers a wide range of luxury accommodation with 103 rooms, 39 suites, and 5 luxury apartments – however it still manages to maintain an air of intimacy like a private residence. In 1758, architect Jacques-Ange Gabriel drew plans for the future “Place Louis XV”, including two palaces of nearly one hundred meters in length, fronted by a Corinthian colonnade. One of the palaces was initially home to the Duc d’Aumont, who decorated it sumptuously in the typical French style of the period. In 1788, the Comte de Crillon acquired it, and gave it his name. The Crillon remained a family home until 1907, before being turned into a hotel in 1909. Many historical and sightseeing spots are walking distance from the hotel. The concierge will be more than happy to point out the most interesting visits, the best restaurants and evening venues. The hotel has single and double rooms, as well as a variety of suites from a Junior Suite to the Bernstein Suite. The Bernstein Suite is world famous, with several films having been shot here – and it has two beautiful terraces overlooking the Place de la Concorde – it has been called the most beautiful apartment in Paris by many people! Throughout all suites and rooms there are modern amenities which complement the 18th century French décor. The most intimate of the luxury hotels in Paris, and formerly a family residence, the Hôtel de Crillon offers guests the best of Paris and the best of the French “art de vivre”. The guest relations team will look after your ever need – there is 24-hour room service offering a tempting, refined menu to suit any fancy, from a light snack to a gastronomic feast accompanied by the finest wines. 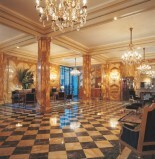 The hotel staff provide a wealth of cultural information about Paris and can prepare a fully personalized program. The Crillon’s name is a true key to unlock the delights of the city. Being situated in the heart of Paris, you really do have the world at your finger tips! Hotel de Crillon is close to many world famous sights, and also to some fantastic shopping locations. Next to the Rue du Faubourg Saint Honoré and Rue Royale, well known for their designer boutiques, the Hotel de Crillon neighbours legendary fashion houses such as Dior, Lanvin, Hermès or Cartier. Close by, the Rue de Rivoli and the Champs Elysées also offer the best of the French and international Haute Couture, jewellery, leather goods and art.